This timber frame, five bedroom dwelling house is known locally as "Uncle Bill Pynn's House." It was constructed by William Henry Pynn and Henry Bartlett in 1892 and is the oldest surviving house in Quirpon. View of the side and rear façades before restoration. The William Henry Pynn House is a well-preserved example of 19th century vernacular architecture. The roof boards and clapboard are fir, cut locally, as was the wood for the flooring, which was sawn by Mr. Pynn. Today, there is not a single tree left in the community. The house sits on the site of a former Pynn house, built by William Henry Pynn's grandfather, Henry Pynn. Born in 1796, he moved to Newfoundland around 1820, and was the first Englishman to settle permanently in Quirpon. The windows and some of the boards used in the current house were salvaged from the previous building. The high pitch roof is typical for houses of the period. The back kitchen was reduced in size in the 1940s. The house originally had a verandah, or bridge which ran around two sides of the building to the north and east. One of the bedroom doors came from the wreck of the SS Beothic, a steamer which was lost on December 8, 1940, near Griquet, not far from Quirpon. 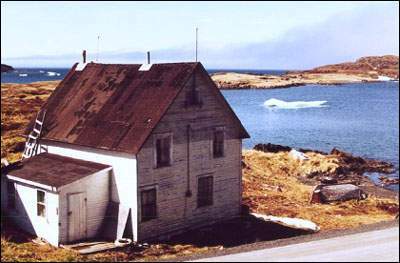 The house is situated by itself in Pynn's Cove. At one time there was a large stage and wharf 200 feet to the north, with fish flakes and outbuildings. The premises also included a large bunkhouse for up to 20 sharemen who came from as far away as Trinity Bay and Bonavista Bay. For many years, the Pynns had nine codtraps in the water at the same time and worked four fishing crews. The house was known as a safe haven for visitors, including Cape Bauld's lighthouse keepers if stranded in a storm while visiting neighbouring communities. William Henry Pynn's son, Gilbert Joseph Pynn, was the only wharfinger ever appointed by the Newfoundland government for its wharf in Quirpon, and coastal boat passengers often went to visit and pass the time while waiting for their departure. Before Confederation, William Henry signalled ships into Quirpon Harbour with coloured signal flags. The flagpole used is still atop a knoll directly behind the house, and flew the Union Jack on special occasions. In the 1920s, Dr. Wilfred Grenfell visited the property while on his way to Battle Harbour, pausing to administer medicine to a young Gilbert Joseph, then suffering a severe case of the croup. In 1929, two young girls drowned in Quirpon Harbour during Christmas, and were laid out in the living room until the water drained from their clothes, a story immortalized in Wayne Bartlett's book Grandpa, Tell Me a Story (1997). The building housed the first post office and the first telephone in Quirpon. The Pynns also had one of the first battery-operated radios in the community. According to local tradition, the radio was such a novelty that people would gather at the house to listen even when there was no reception, quite content to sit and listen to static. The present owner, John Pynn, is the grandson of William Henry. The building is remarkable for its age, and is one of the older buildings remaining along that portion of the Northern Peninsula. The building was designated as a Registered Heritage Structure by the Heritage Foundation of Newfoundland and Labrador on September 15, 2001. Also view William Henry Pynn House Registered Heritage Structure on the Heritage Foundation of Newfoundland and Labrador web site. The Newfoundland and Labrador Heritage Web Site has on its site only a portion of the registered heritage structures in Newfoundland and Labrador. To view a complete list or search for a particular structure visit the Heritage Foundation's Property Search page.